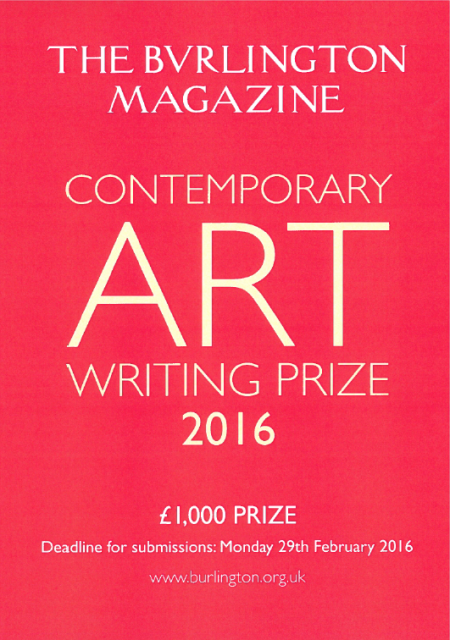 The Burlington Contemporary Art Writing Prize seeks to discover talent young writers on contemporary art, with the winner receiving £1,000 and the opportunity to publish a review of a contemporary art exhibition in The Burlington Magazine. The winner of the Prize will be announced in May 2016. Every applicant will be offered an online subscription to the Magazine at a specially reduced price. The guest judges are the incoming Director of the Tate Britain, Alex Farquharson, and the eminent scholar and Curator of Special Projects in Modern Art at the National Gallery of Art, Washington, Lynne Cooke.